Elegant bedding can transform your bedroom into an opulent retreat. The leading manufacturers of elegant bedding produce some of the most stunning bed ensembles available and many have received peer and industry awards for their quality and outstanding bedding designs. Elegant bedding includes fabrics like silks, laces, velvets, and satins, along with luxurious designs and finished construction that often include applique or embroidery handiwork. Lili Alessandra is one of the best known elegant bedding manufacturers and the 2015 winner of the coveted internationally recognized ARTS Award for Home Textiles Manufacturer. Lilia Alessandra brings style and elegance to any bedroom with unique subtle detailing. Many of the pattern designs can be matched together for a complete set. Angie duvet cover is made from a champagne-colored velvet with a decorative white velvety embroidered applique and is available in queen or king size. The Chloe quilted coverlet reveals a diamond quilting pattern and is reversible; it's also available in queen or king size. The Versailles decorative pillow is a champagne velvet with an ivory velvet applique and includes 95% feather/5% down insert. Individual prices range from $165 to around $775, while the collection can cost into the thousands, depending on which pieces of the set you select for your home. The Vendome collection from the Lili Alessandra line is made of 100% polyester trimmed in velvet for a truly elegant look. It comes in both ivory and taupe, but is especially fetching in seafoam. Vendome duvet: The duvet is made from a silky 100% polyester and trimmed with velvet and a velvet applique. Morocco seafoam pillow: The decorative pillow (rectangle or square) has a velvet embroidered filigree design. Vendome seafoam pillow sham (linked above): This pillow matches the duvet and is made from 100% polyester with a velvet trim and applique. it's machine washable. Individual pieces are priced from about $135 to $450. Depending on the pieces purchased, a set of seafoam bedding will run from $450 to nearly $1,000. 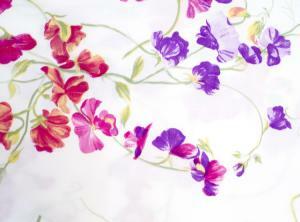 Bella Notte Linens was a 2014 Design Finalist of the Martha Stewart American Made Award. This couture textile company creates vintage-inspired "irresistibly soft" linens that are custom hand-dyed "locally" from natural fibers. 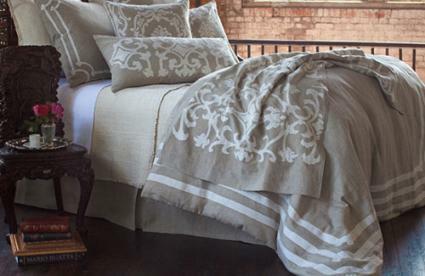 Two trademarks of Bella Notte Linens are elegant designs and easy-care washable linens. Also introduced in 2015, the Josephine collection uses a satin fabric with an orchid embroidery that gives an excellent tonal detailing. Duvet: The satin duvet features a button closure and an embroidered orchid pattern along the lengths of the duvet. Reversible, the duvet can also be used with the solid satin backing. Personal comforter: The soft satin comforter is framed by a wide border of a lovely embroidered orchid pattern. Pillow shams: The matching pillow shams available in Euro or deluxe sizes feature the wide embroidered orchid pattern centered on the sham. Pillowcases and throw pillows are also available. Costs start at just under $200 and runs just over $1,000 for each item. A full set will could cost upwards of $2,000 or more, once you factor in each item you choose. D. Porthault bed linens are found in "the most exclusive hotels in the world", have been customized for both Buckingham Palace and the White House. Beverly Hills Lifestyle notes that they are on the beds in "Asia's finest luxury hotel", the Imperial. In 1920, Madeleine and Daniel Porthault gave the world the first printed bed linens. Madeleine Porthault was inspired by "her love of Impressionist art and the gardens at Giverny..." The work of the popular fashion designer Maggie Rouff further inspired her to create stunning and colorful sheets that were rich with "dressmaker details". The Pois de Senteur Pink collection is a cotton percale with a printed floral design, featuring such hand-finished touches as a white scalloped bias. Duvet: The duvet features a piped edging and button closure. Bed sheet sets: The set includes the top, flat bottom and two standard pillow shams. Other pillow shams: Also available are king size, Euro, boudoir, and neck shams. Pricing starts around $325 and will run to around $1,800. Purchasing the collection will cost around $2,750 to $3,150. Art Déco is white-on-white hand-appliquéd design on cotton voile. The stylized border embroidered pattern reflects the iconic Chevron pattern. Duvet: The duvet features a button closure and is framed by the stylized hand-appliquéd white-on-white design. Bed sheet sets: The set includes the top, flat bottom and two standard pillow shams and features the embroidered appliqué. Other pillow shams: Also available are king size, Euro, boudoir, and neck shams that carry out the same border design. These luxurious bedding pieces start around $600 and run over $3,600. The entire collection can cost over $4,000. The American company Anichini specializes in "artisanal fabrics and home furnishings". The company enjoys a "global luxury brand" of high-quality made from the finest materials. The fabrics are "cut and sewn" by "skilled local craftswomen" and are considered the "heirlooms of tomorrow". The company's Turkish collection was featured in Architectural Digest's June 2015 Most Wanted List. The Taj bedding pattern was selected by designer Matthew Patrick Smyth for the master bedroom in ELLE DECOR's 2013 Designer Visions Show House. Duvet: The colorful and paisley design duvet is finished in a "Sack" style for easy use. Pillow shams: Various shams are available that include boudoir, standard, queen, king and continental. Pillow cases: Available in this popular pattern are standard, queen and king pillowcases to add another layer to your bedding design. Pieces are priced starting around $145 and go to over $1,100. Purchasing the collection could potentially cost over $2,000. Nothing is more elegant than Sferra's luxurious long-staple Egyptian cotton bedding. Sferra has led the world in high-end luxury linens for 120 years. Sferra linens grace the beds of the White House. These Italian bed linens are known for high-quality and are coveted as family heirlooms. Sferra has won numerous awards over the past 120 years. In 2005, Sferra was awarded the "ASPIRE Product and Design Award" from the Home Fashion Products Association. In 2006, Sferra won two Textile Industry Awards. 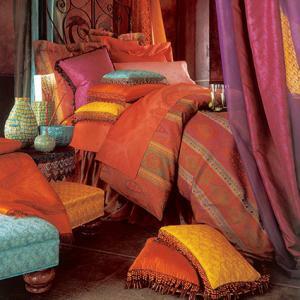 In 2011, at the New York International Gift Fair, Sferra won Best New Product in Bedding for its Utopia Down Collection. In 2012, the company was an Icon Honors winner and won the 2014 Arts Award in the home textiles category. The Milos Collection is considered by Sferra to be "One of Our Most Luxurious". The fabric boasts an "incredibly fine hand" as well as a "soft, silken shimmer" that create a "luxurious drape". Available in white and ivory colors. Duvet: Made from the "very finest" longest-staple Egyptian cotton, the duvet boasts a "luminous sateen" with a soft and supple appeal. Sheets: Flat and fitted sheets for full/queen, king and California king (fitted sheet) are part of the collection. Pillowcases: Sold in pairs, the pillowcases come in standard and king size. Pillow shams: Boudoir, standard, King and Continental sham choices are included in the collection. Slightly higher priced that the Denina bedding, the Milos pieces will cost between $170 and just above $1,800. You can choose pieces to create your set that could cost over $2,500. Perhaps the most important design element for an elegant bedroom is the bedding itself. It doesn't pay to scrimp on this component of your design if you wish to get the best possible look. Rich luxurious fabrics with excellent tactile properties ensure your design meets all expectations.